Discover the Networks | Hank Johnson Jr.
Hank Johnson Jr. was born on October 2, 1954 in Washington, DC. He earned a BS at Clark College in 1976 and a JD at the Thurgood Marshall School of Law in 1979. Johnson subsequently worked for twelve years as an associate judge in the DeKalb County (Georgia) Magistrate Court; five years as DeKalb County commissioner; three years as chair of the DeKalb County budget committee; and a number of years as a criminal and civil litigator for the Johnson and Johnson Law Group. In 2008 he served as co-chair of the Barack Obama Presidental Campaign in Georgia. After defeating incumbent Cynthia McKinney in the 2006 Democratic primary race for Georgia’s 4th Congressional District seat, Johnson was elected to the U.S. House of Representatives. He has held that post ever since, and is a member of both the Congressional Black Caucus and the Congressional Progressive Caucus. On December 22, 2009, Johnson was one of 33 U.S. Representatives who signed a letter to Hillary Clinton, calling on the Secretary of State to pressure the Israeli government to end its ban on Palestinian student travel from Gaza to the West Bank. “We applaud your efforts to support educational opportunities for Palestinian youth, including your initiative to increase U.S. funding for Palestinian universities and educational programs in Gaza and the West Bank,” added the letter. In December 2014 Johnson told a radio interviewer, “Barack Obama has been one of the greatest presidents that we have had in the history of this nation. It’s unfortunate that since he raised his hand and took the oath in his first inauguration, that he’s been met with nothing but opposition, and confrontation, and actual, personal dehumanization.” Further, the congressman condemned the popular black conservative and Republican presidential candidate Ben Carson for: (a) “trying to tap into the ignorance of people who have been whipped into a frenzy, like a lynch mob,” and (b) appealing “to the lowest common denominator” of the human spirit. During a six-day tour to East Jerusalem and Ramallah sponsored by the Palestinian group MIFTAH in the spring of 2016, Johnson was one of five U.S. congressmen who met with Shawan Jabarin, a longtime Popular Front for the Liberation of Palestine operative who had since served as: the general director of Al-Haq, a vice president of the International Federation for Human Rights, a member of the Human Rights Watch Middle East Advisory Board, and a commissioner for the International Commission of Jurists. The other congressmen who met with Jabarin included Democrats Luis Gutierrez, Mark Pocan, Matt Cartwright, and Dan Kildee. In November 2016, The Daily Caller asked Johnson to comment on the fact that Rep. Keith Ellison, who was seeking to become chairman of the Democratic National Committee, had once advocated the creation of a geographically self-contained “homeland” for black people. “I don’t see anything really objectionable,” Johnson replied. “What he [Ellison] apparently proposed was a partitioning of the United States into a southeastern section.” When asked if Ellison’s proposal constituted black nationalism, Johnson said: “I don’t know what to call it. It seems to have been born out of academia, a thoughtful discussion on possibilities.” “These are not ideas that have not been discussed by black folks throughout history,” Johnson added, noting that he himself would have supported such a plan during his college days. For an overview of Congressman Johnson’s voting record on an array of key issues, click here. For additional information on Hank Johnson Jr., click here. Further Reading: “Hank Johnson Jr.” (Votesmart.org, Keywiki.org). “Congressman Who Feared Guam Might ‘Capsize’ Recites Police Brutality Poem on House Floor” (PJ Media, 12-4-2014). “Dem Rep. Hank Johnson: Amend Constitution to Restrict Freedom of Speech” (CNS News, 11-29-2012). “Rep. Hank Johnson on NRA: ‘They Still Cannot Get Over’ That Obama Is ‘Black’” (CNS News, 1-16-2013). “Hank Johnson: Clarence Thomas ‘Worse’ Than Edward Snowden For Gutting Voting Rights Act” (Huffington Post, 6-27-2013). “Hank Johnson: Ben Carson Appeals to ‘Lowest Common Denominator’” (Newsmax.com, 12-8-2014). “Rep. Johnson: ‘Don’t Think That Regulations Are Hurting You’” (CNS News, 1-15-2015). “Obama’s Anti-Netanyahu Boycott Is Collapsing” (Front Page Magazine, 2-17-2015). “Rep. Hank Johnson on ISIS: Obama ‘Did Exactly What Needed to Be Done’” (CNS News, 3-17-2015). 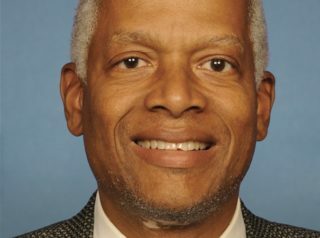 “‘It Feels Like Open Season on Black Men in America and I’m Outraged’” (Washington Examiner, 4-14-2015); “Dem Rep. Hank Johnson: Racist Police Culture Enables “Officers To Shoot To Kill Blacks”…” (WeaselZippers.us, 6-30-2015). “Rep. Hank Johnson: ‘Free Market Way of Thinking Doesn’t Work’” (Breitbart.com, 1-8-2016); Click here for details of the the Sunshine For Regulatory Decrees and Settlements Act. “Dem Reps Met With Alleged Member of Palestinian Terrorist Group” (Weekly Standard, 11-17-2016). “Congressman: Jewish Settlers Are Like Termites” (Washington Free Beacon, 7-25-2016). “Exclusive: Black Congressmen Refuse to Condemn Ellison’s Past Proposal for a ‘Black State’” (Daily Caller, 11-30-2016). “Dem Rep. Johnson Repeatedly Compares Trump to Hitler in Speech” (Fox News, 1-2-2019).